Carnival Cruise Line’s newest ship, Carnival Horizon, made its US debut in New York City May 23 with a VIP invitation-only pier side overnight featuring a naming ceremony with godmother Queen Latifah. Latifah also squared off in a special version of Lip Sync Battle against Jake Elliott of the Super Bowl champion Philadelphia Eagles. The ship is offering a summer schedule of four-day Bermuda and eight-day Caribbean voyages from New York before repositioning to Miami for year-round six- and eight-day Caribbean sailings in September. 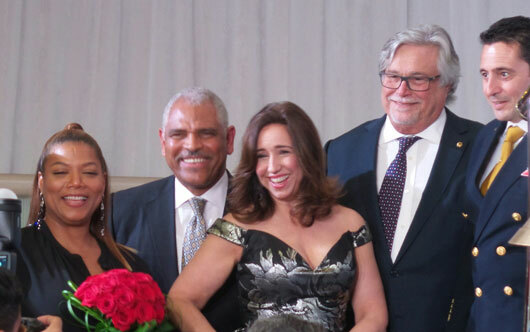 Pictured, Latifah, Carnival Corporation president and CEO Arnold Donald, Carnival President Christine Duffy, Micky Arison, chairman of the board, Carnival Corporation, and Carnival Horizon Captain Luigi De Angelis (far right).